Viscose plant causes heavy pollution of the air and nearby waters through untreated wastewater discharge, possibly linked to cancer in local residents. China currently produces over 65% of the world’s viscose fibre; its 21 viscose manufacturers produced 3.511 million tonnes in 2016 and this amount is expected to continue to increase . 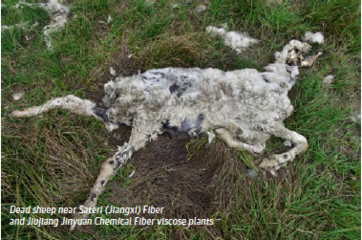 As is the case with India and Indonesia who are the other two major producers of viscose fibre, the combination of government support, cheap labour and lax regulations is what has pulled viscose production away from Europe and into China . Sateri Holdings is a Chinese company and one of the largest cellulose producers in the world; they have 4 plants across China, owned by different entities . Sateri (Jiangxi) Chemical Fibre Co. which is the plant in question for this case study was Sateri Holdings’s first mill and opened in 2004 in Jiujiang . The plant is owned by the Singapore based Royal Golden Eagle International (RGE); a group owned by Indonesian billionaire Sukanto Tanoto. . The plant is located in Gutang Town, close to Poyang Lake, Lushan mountain as well as Jinyan Chemical Fibre Co. (another viscose plant) . Like most viscose manufacturers, the plant produces viscose staple fibre (VSF) and sodium sulphate. “Brands and retailers sourcing from Sateri include: H&M (Sweden), Marks & Spencer(UK), Zara/Inditex (Spain), Tesco (UK)” . Mobilisation and Resistance: It shall be noted that in the case of industrial pollution in China, often times it is very difficult for local communities to mobilise or protest. Polluting industries bring economic activity and employment to local towns, so villagers are most of the time highly dependent on the industrial activity. Furthermore, it is not uncommon that companies hire security in order to ensure that journalists and investigators cannot report on any wrongdoings of the factories. Corruption and support from secretive governments is another reason that makes it very difficult for residents to stand up for their rights. A Changing Markets report states that a Chinese internet user “claiming to be a former Sateri staff member accused Sateri of pollution and the local authorities of turning a blind eye” in 2011 . Villagers say that they have tried to complain about pollution and untreated wastewater entering their water supplies . A Chinese newspaper attempted to confront Sateri about their plant allegedly discharging untreated wastewater which local villagers had been complaining about, however Sateri denied all allegations and claimed they comply with all regulations when it comes to wastewater treatment . Villagers on the other hand claim they have repeatedly tried to complain to the government and the Environmental Protection Agency but this issue just does not get taken care of . 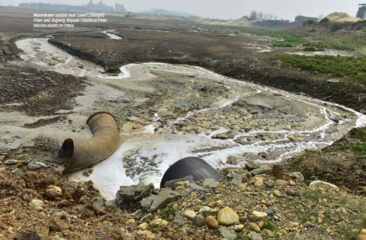 Environmental and Health Impacts: According to a few media reports analysed by Changing Markets, there have been several environmental impacts from the pollution caused by Sateri (Jiangxi) Chemical Fibre co. villagers in the area complain about a terrible smell in the air which they believe to be coming from the wastewater discharge of the factory . Furthermore, vegetation close to the factory is dying and almost all the fish and shrimp in the nearby waters are also dying, making fishing an impossible activity . According to a Chinese newspaper called Consumption Daily, incidents of cancer in patients living near Sateri’s plants are higher than other villages that are not near these industries . The local environmental protection agency, the Jiujiang City Environmental Protection Bureau conducts tests in the area for pollution, however the problem is that they do not test for hydrogen sulphide or carbon disulphide, which are the two main toxic chemicals that are linked to viscose manufacturing  . Changing Markets investigators observed terrible smells in the air in Gutang town and especially in areas close to the Sateri plant . They also conducted tests that the environmental protection bureau had not done, and concluded that the level of hydrogen sulphide near the plant was 12 times over the recommended limit . It is hydrogen sulphide which causes a terrible acidic stench which is highly toxic. The Changing Markets investigators were unable to conduct water tests due to the high security around the Sateri plant, however it is believed that the plant discharges untreated effluent into Poyang Lake and the nearby Gushan Lake . Project Details The Sateri (Jiangxi) Chemical Fibre co. plant opened in 2004 in Jiujiang. Two lines were added in 2010, and currently it has four lines and a design capacity of 160,000 tonnes . Why? Explain briefly. The company is still polluting the air and water and is claiming to be compliant with all regulations. Local residents try continuously to complain to the government yet nothing is being done. Blanc, P.D. 2016, Fake silk: the lethal history of viscose rayon, Yale University Press, Cumberland. Other Comments This sheet mostly draws from the report by Changing Markets Foundation 2017, "Dirty Fashion: How pollution in the global textiles supply chain is making viscose toxic"